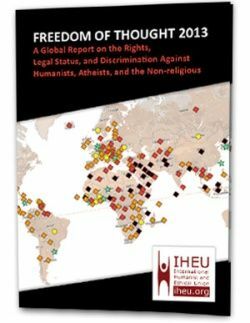 On Tuesday December 10th, the International Humanist and Ethical Union (IHEU) released a report titled ‘The IHEU Freedom of Thought Report 2013’ which focused specifically on the rights, legal status, and discrimination against Humanists, atheists and the non-religious in every country in the world. While the worse result of being a freethinker could be death, there was some kind of discrimination in most countries including the United States. This entry was posted in Humanist Movement, Issues and tagged atheism, dissent, IHEU, IHEU Freedom of Thought Report 2013, International Humanist and Ethical Union, religious discrimination, religious freedom on December 13, 2013 by Doug.